A couple of weekends ago, our Durham Attack Black Venom boys won a gold medal at the Rochester Can-Am Bid Qualifier in the U.S. Last weekend, the boys returned back to Canada to compete at the McGregor Cup Premier division in Richmond Hill. The boys really liked playing back in the OVA, since the net height for U15 Boys is 3 inches lower than in the U.S. 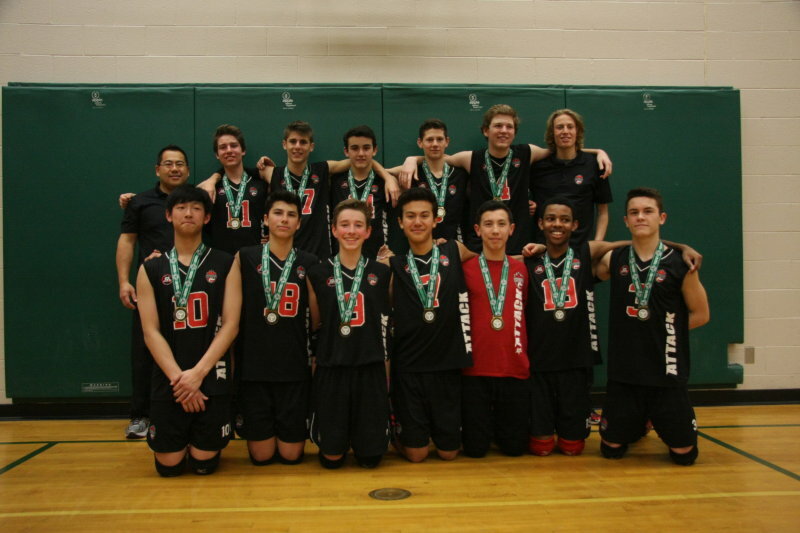 The boys opened the Pool Play with 2-set wins over Aurora Storm and Markham Wasps. The win over the Markham Wasps was particularly sweet, since we were able to avenge an earlier match loss in a prior tournament. In the quarter-finals, Black Venom faced off against a formidable squad from Niagara Fury. Early in each set, points were traded back-and-forth in a tight, see-saw battle of sideouts. Neither team seemed to be able to string together a streak of more than a few points. In the end, our Black Venom boys eventually prevailed in a tight 3-set match win (25-20, 24-26, 15-9). In the semi-finals, we breezed past the Ottawa Fusion (25-13, 25-12) and once again, we confronted the Kitchener-Waterloo Predators for the finals. The KW Predators are a very familiar opponent, as they are also considered a top-rated team in the province. They always play solid defense, often keeping the ball alive until the opponent makes an unforced error. For this tournament, our boys really focused on limiting errors and won the gold medal in another thrilling 3-set win (25-15, 24-26, 15-10). Quite notably, our serving was the key edge throughout the day. Statistically, our team only missed 6.5% of all our serves (as compared about 11% – 15% in prior tournaments). More importantly, our serving was very tough, resulting in many aces and free ball opportunities for the boys to run our offense.